Pirates are one of the most classic Halloween costumes out there. Next to clowns and cowboys, pirates are also one of the most recognizable looks you can get. Which is why, to stand out, you need to add those extra details to your costume. Otherwise, you'll just be another pirate in a sea of the same. Good thing we've got you covered. 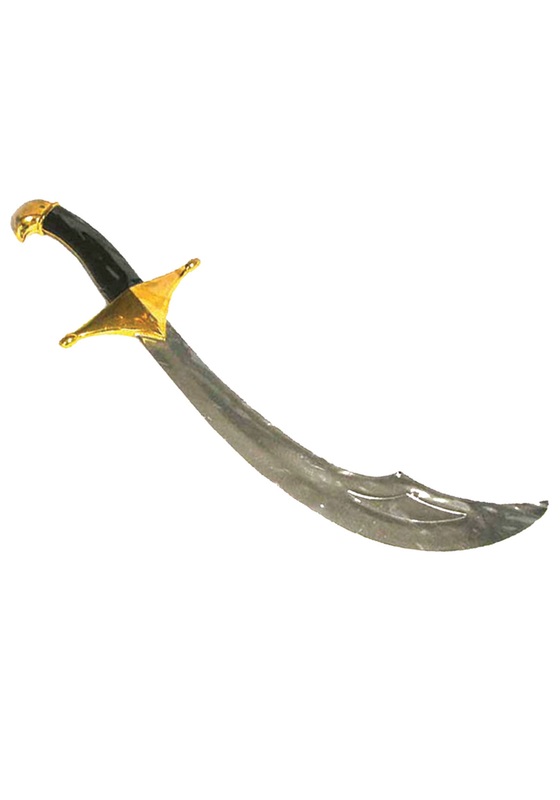 This cutlass style sword is perfect for your Arabian pirate costume this Halloween. Whether you are traversing the desert or the ocean, this cutlass will be there to protect you. Gear up any little warrior for an adventure! The Arabian cutlass sword is made of plastic and features a reflective silver, plastic curved blade. The handle is black with a gold colored hilt. It makes a great accessory for any pirate or genie costume this Halloween. Don't leave your little one unprepared as they take off on their adventure - give them what they need to show they mean business with this cutlass!